A French writer of memoirs born on 4 December 1879 in Paris' IVth district and died on 25 December 1951 in Paris' VIIth district. Roger Boutet de Monvel was the eldest son of Maurice Boutet de Monvel (1850 - 1913), a famous painter, watercolourist and celebrated children's illustrator; and brother to the painter, engraver and illustrator Bernard Boutet de Monvel (1881 - 1949). Raised in both Paris and Nemours, where his maternal grandparents owned a house, he modelled a great deal for his father, particularly in the illustration of Nos enfants (Our children) by Anatole France, where his outline regularly appeared and where a chapter entitled L'écurie de Roger (Roger's stable) is devoted to him. As an enthusiast of literature from a very early age, and historical memoirs in particular, Roger Boutet de Monvel initially became a secretary to the director of the Imprimerie Nationale (HMSO) after studying Arts and completing a yearlong stay in England. He then published his first texts and articles for the magazines, generally in collaboration with his father or brother, such as Children's costumes in the nineteenth century (from 1800 to 1870), which was published in 1904 in Century Magazine, and for which Maurice Boutet de Monvel did the illustrations. 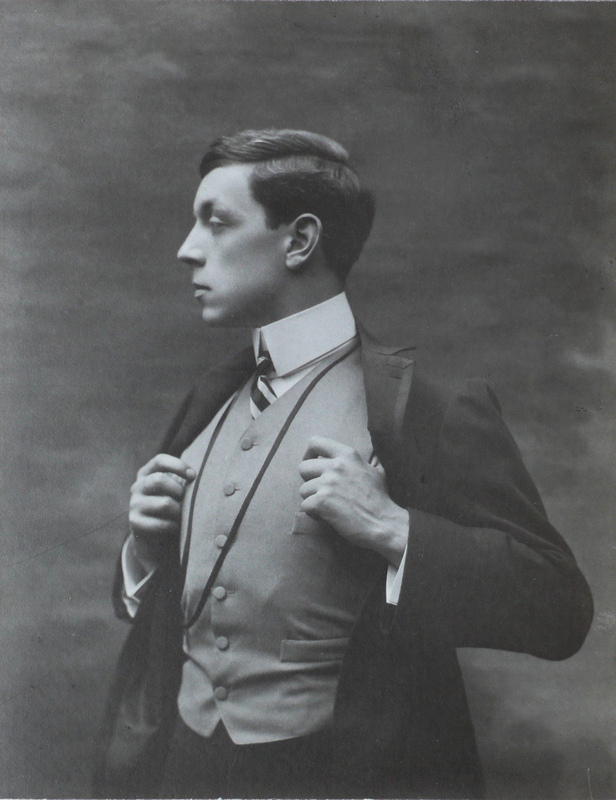 In 1905, whilst on his way to becoming one of the capital's most prominent dandies with his brother, Plon publishers, which was to remain his publisher, released his first historical study entitled Les variétés (The variety shows), (1850-1870) and then in 1906 Georges Brummel and Georges IV. In 1911, he went with Plon again to publish Les anglais à Paris (The English in Paris) 1800 - 1850 and, that same year, joined the Carnavalet Museum as preservation officer, where he met the illustrator, Guy Arnoux (1886 - 1951), whom he later introduced to his friend, couturier Paul Poiret. In 1912, Roger Boutet de Monvel was invited by Lucien Vogel (1886 - 1954) to participate in the Gazette du Bon Ton adventure, a leading fashion magazine, becoming one of its regular authors from then on. Mobilised during the First World War, he suffered a leg injury very early on and was discharged. He was then sent to The Panama-Pacific International Exposition in San Francisco in 1915, where he championed the French fashion industry. Then, at the end of 1916, he accompanied Paul Poiret in another propaganda mission, this time in Madrid. The following year, he published a set of promotional texts for Paul Poiret's Martine store in the famous Almanach des arts et des lettres (Arts Almanach) under the leadership of Raoul Dufy. That same year, 1917, Roger Boutet de Monvel published a small illustrated collection of propaganda at Devambez, with his illustrator friend Guy Arnoux, which went by the name of Carnet d'un permissionnaire (Notebook from a soldier on leave), which was to be followed in 1918, by the Le bon anglais (The good Englishman) and Nos frères d'Amériques (Our American brothers). During this time, Roger Boutet de Monvel was working on Grands seigneurs et bourgeois d'Angleterre (Grand gentlemen and bourgeois from England), which also came out with Plon publishers in 1918. After the war he rekindled his collaboration with fashion magazines like Gazette du Bon Ton, Vogue and Monsieur, and in 1921 he published Une vie de Saint François d'Assise (Saint Francis of Assisi's life) with Plon, which was a work illustrated by his father, who died in 1913. Using the same publisher La vie de Lord Byron (Lord Byron's life) came into print in 1924, followed in 1929 by La vie martial du Bailli de Suffren (The Taskmaster of the Suffren's martial life), for which his brother Bernard did the advertising poster. Becoming a regular contributor to Harper's Bazaar in 1925, like his brother, he published texts such as We view the maze of Manhattan, which appeared in 1927's February edition. In 1933, Roger Boutet de Monvel went on to publish Cerventès et les enchanteurs (Cervantes and the magicians) with Plon publishers, before publishing Chili et Perou (Chile and Peru) with Le Divan publications in Paris in 1937. From the end of the thirties, Roger Boutet de Monvel devoted his time to writing Mémoires (Memoirs), which remains an unpublished work to this day, where his society friendships, especially those kept up with Count Edgard de Barral and Prince Léon Radziwill, were to be given prominence. Les Variétés (The Variety Shows - 1850 - 1870) Plon publishers Paris 1905. Georges Brummel and Georges IV Plon publishers Paris 1906. Les anglais à Paris (The English in Paris) 1800 - 1850 Plon publishers Paris 1911. Grands seigneurs et bourgeois d'Angleterre (The grand gentlemen and bourgeois of England) Plon publishers Paris 1918. Une vie de Saint François d'Assise (Saint Francis of Assisi's life) illustrated by Maurice Boutet de Monvel Plon publishers Paris 1921. La vie de Lord Byron (Lord Byron's life) Plon publishers Paris 1924. 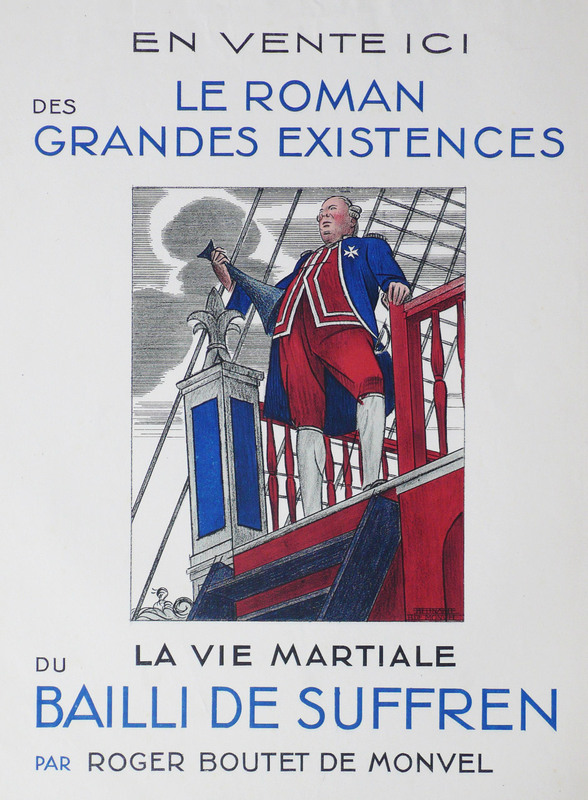 La vie martial du Bailli de Suffren (The Taskmaster of the Suffren's martial life) Plon publishers Paris 1929. Chili et Perou (Chile and Peru) Le Divan publishers Paris 1937. Mémoires Inédit (Unpublished Memoirs) 1941 – 1946.